Sydney 2012 - Great to see so many Palominos entered on the day! 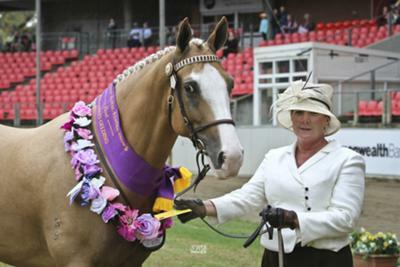 Best Presented Palomino was won by "Karizmah Puttin' on the Ritz" Suellen Brook. Our judge, Mr Alan Preston was very professional in his approach to all classes and exhibitors. A big thank you must go to the stewards who kept all of us on time, and were very helpful if needed. Our trophies were presented to winners by the President from the NSW Palomino Society. Dilutes Aust also donated Garlands as prizes. It was wonderful to see so many ridden palominos in both height classes. Although wet, some of us were lucky enough to have our ridden class before it pelted rain, but others didn't. You know it is heavy when horses in the lineup try to "turn tail" to the rain! I can only speak for the over 14hds ridden class as we were out the back for the under 14hds class. However, credit must go to all competitors in this ridden class as all horses went well. A few horses were educated enough to lengthen well and some popped off flying changes in their workouts. However, this was an optional change. It was lovely that competitors wished each other luck as we went in, and congratulated on the way out. This made it a great day for everyone who competed. Congrats on a great result for you and the boy. Now you only have to get the side saddle going and then go down and compete in that! Well done on a great Sydney Royal Suellen and thank you for providing this write up and photos for us.